Where do the Pittsburgh Penguins rank among past Stanley Cup winners? Computer simulation plays the Penguins vs. Pittburgh's other Stanley Cup winners, plus recent champions throughout the league. 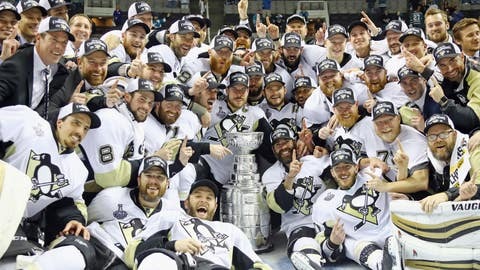 The NHL’s newest champions are no stranger to Lord Stanley’s Cup. The Pittsburgh Penguins have now won two titles in the Sidney Crosby era, with the 2016 championship joining 2008-09 cup-winning season. Pittsburgh also won two championships during Mario Lemieux’s time with the club, claiming back-to-back cups in 1991 and 1992. But how does the 2016 squad compare to its predecessors? We turned to WhatIfSports.com’s NHL simulation engine to find out. The expression "the latest and greatest" seemingly doesn’t apply to the Penguins. The 2015-16 team finished last in the simulation, winning 39.5 percent of games. The best team was Pittsburgh’s first champion, the 1990-91 squad, which won 60.1 percent of the time while averaging 4.80 goals per game. The 2015-16 Penguins finished 25th in a 26-team field, winning 37.0 percent of contests. Only the 2011-12 Los Angeles Kings, who won the Stanley Cup as an eight seed, finished with a lower winning percentage. Pittsburgh’s other participants weren’t much better. None finished in the top half of the simulation, with the 2008-09 team finishing a franchise-best 16th. The 1990-91 Penguins were 18th despite leading the tournament in scoring. Colorado proved best franchise in the tournament, with its two teams taking the top two spots. The 1996 Avalanche narrowly edged the 2001 team, with the 2013 Blackhawks a close third.